What do you think about Springer Nature and its family of journals? Tell us in our 10 minute survey. This paper investigates the effect of microwave curing on the bond strength of steel reinforcement in concrete repair. Pull-out tests on plain mild steel reinforcement bars embedded in four repair materials in 100 mm cube specimens were performed to determine the interfacial bond strength. The porosity and pore structure of the matrix at the steel interface, which influence the bond strength, were also determined. Test results show that microwave curing significantly reduces the bond strength of plain steel reinforcement. The reduction relative to normally cured (20 °C, 60% RH) specimens is between 21 and 40% with low density repair materials and about 10% for normal density cementitious mortars. The corresponding compressive strength of the matrix also recorded similar reduction and microwave curing resulted in increased porosity at the interface transition zone of the steel reinforcement. A unique relationship exists between bond strength and both compressive strength and porosity of all matrix materials. Microwave curing reduced shrinkage but despite the wide variation in the shrinkage of the repair mortars, its effect on the bond strength was small. The paper provides clear correlations between the three parameters (compressive strength, bond strength and porosity), which are common to both the microwave and conventionally cured mortars. Therefore, bond-compressive strength relationships used in the design of reinforced concrete structures will be also valid for microwave cured elements. Reinforced and pre-stressed concrete infrastructure in the world has approached a stage where repair is often necessary due to various concrete degradation mechanisms, abnormal loading or poor workmanship. Although most concrete construction is highly durable in all kinds of environments, the concrete repair and maintenance market has grown exponentially in recent decades due to significant durability failures. It is essential to regularly monitor the performance of reinforced concrete infrastructure and carry out timely repair to extend the service life of the concrete structures and to prevent failure. However, factors affecting the durability of repair itself have become a concern in recent years as most repairs prove unsatisfactory within a few years [1, 2]. The rapid development of strength at early age during the application of repair is highly desirable as it can provide an efficient and economic repair. This enables minimum disruption to traffic, for example, during localised repair in concrete pavements. Precast industry can also benefit from rapid strength development by increasing their turnover. Another important economic advantage provided by high early age strength development is to enable concrete construction in cold weather . This will allow continuous construction activity in winter, thereby improving the economics of the construction industry in cold regions of the world. Conventional heating methods are currently used in the concrete industry to achieve high early-age compressive strength of concrete. However, there are limitations with these methods  and they cannot be used efficiently, safely and economically especially for in situ repair or for new construction on site. Microwave technology, on the other hand, is potentially a very effective method to cure cementitious repair materials at early age and develop strength rapidly. Unlike conventional heating, microwave curing generates heat from within concrete or a repair patch to provide uniform heating across its depth. Less than 1 h of microwave exposure applied in the first stage of hydration is sufficient to achieve the desired curing temperature [5, 6, 7]. There is already considerable research [8, 9, 10, 11, 12] on the use of early age microwave curing to accelerate strength development of concrete. The expected advantages of microwave curing have led to research around the world on developing microwave prototype systems [13, 14, 15] for commercial use. Most of the research on microwave curing of concrete has focused on normal concrete materials with limited attention to steel reinforced concrete and to in situ concrete repair which incorporates both proprietary repair mortars and steel reinforcement. Microwave curing of concrete with steel reinforcement raises two basic concerns. The first is safety relating to the electrically charged or reflected microwave energy causing sparks and overheating at the steel surface. The second concern is the effect of microwave curing on the bond between steel reinforcement and concrete, which is fundamental to the composite action of reinforced concrete. The first concern has been addressed by exposing parts of steel reinforcement protruding from concrete specimens to microwave powers of up to 420 W without recording any adverse effect . 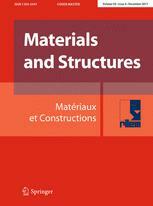 The second aspect of reinforcement bond strength is addressed in this paper. It deals with the bond of plain steel reinforcement embedded in different concrete repair materials. Another aspect of bond strength which is of critical importance for the efficient performance of concrete repair is the interfacial bond between the substrate concrete and patch repair, which has been reported elsewhere . The composite performance of reinforced concrete depends on the efficient interaction between the steel reinforcement and the concrete matrix, which relies on their bond strength. Plain steel bars provide a true bond failure mechanism with concrete, which includes chemical adhesion and frictional resistance. The pull out strength of deformed reinforcement bars overestimates the basic bond strength by including the mechanical interlock strength of the concrete . The simple pull-out mechanism of the plain rebar embedded in concrete is made more complex by the bursting forces generated by the wedge action of ribs on the rebar which is confined to different degrees by the concrete cover and confining reinforcement [18, 19]. The bond behaviour is influenced by factors such as the rib geometry, their relative surface area  and interlock with concrete lugs . The fib model design code  provides a basic expression for rebar bond strength, relating it to the square root of concrete strength while also incorporating other empirical coefficients which depend on many parameters such as geometry of the section, strength, diameter and surface geometry of reinforcement, concrete cover, bar spacing and confinement of reinforcement . However, the main aim of the research reported in this paper is to isolate and determine the effect of microwave curing on reinforcement bond strength without introducing other factors which may interfere with the clarity of results. Therefore, plain reinforcement bars have been used in the experimental programme to provide a basic bond mechanism. In practice also, many reinforced concrete structures which have been constructed with plain steel bars in the past have reached their repair stage and the bond of this reinforcement in repair patches has become important. The main parameters of microwave curing which are likely to affect the interfacial bond strength are the porosity and pore structure of the matrix at the steel interface, the shrinkage of the matrix and its compressive strength. Therefore, in addition to pull out tests of reinforcement, the test programme of this investigation also determines the effect of microwave curing on the porosity and pore structure of the matrix by mercury intrusion porosimetry, shrinkage and compressive strength by standard test methods . The results of the bond strength are related to these parameters. This paper is part of a larger research project funded by the European Commission on microwave curing of patch repair and to develop a prototype system for in situ curing of concrete patch repairs (FP7 MCure project). The prototype has been successfully tested on 1 m × 1 m patch repairs and is being taken to the next stage of commercial development. Repair Material 1 A proprietary shrinkage-compensated, rapid hardening cement mortar with pulverised fuel ash. Density of the fresh mix was 2260 kg/m3. Repair Material 2 A proprietary polymer-modified cement mortar, fibre-reinforced and shrinkage-compensated. Density of the fresh mix was 1730 kg/m3. Repair Material 3 A proprietary lightweight, low permeability, polymer-modified cement mortar. Density of the fresh mix was 1540 kg/m3. Repair Material 4 A mortar with CEM II/A-L 32.5 R Portland-limestone cement , coarse sharp sand (50% passing a 600 μm sieve) and w/c ratio of 0.45. Density of fresh mix was 2200 kg/m3. A Sharp Model R-2370 commercial microwave oven with a maximum actual output power of 1320 W was used for curing the specimens. It was calibrated according to ASTM F1317  and BS EN 60705 . The microwave oven could be set to generate power at incremental levels of 10% up to 100% of its maximum output. The microwave frequency of the oven was 2.45 GHz. A 10% power level was used to generate actual output power of 132 W to microwave cure specimens. Lower powers of 92 and 60 W were also used for some tests. The effect of microwave curing on the bond strength between plain (un-deformed) mild steel bars and various repair materials was determined in a laboratory investigation. Steel bars of diameter 10 mm and length 255 mm were used in the investigation. One end of each steel bar was machined on a lathe to create a threaded length up to 15 mm to connect the test specimen to a hinge joint which provided alignment of the specimen with the applied load during the pull out test. Prior to casting the specimens, each steel bar was cleaned with acetone and dried before it was placed horizontally across the entire length of a 100 mm polystyrene cube mould (wall thickness of 20 mm) by drilling two opposite vertical faces of the mould. The bar was located along the central axis of the cube and its threaded and un-threaded ends extended 85 and 30 mm respectively beyond the two opposite faces of the polystyrene mould. A plastic sleeve was inserted on the steel bar to provide a 50 mm unbonded length within the cube (Fig. 1). Hence, the effective bond length between the steel bar and the repair material was 50 mm. For each repair material, 12 pull-out specimens were cast from three mixes. Half of the specimens were cured normally (20 °C, 60% RH) and the other half were microwave cured. An additional 4 specimens (2 normally and 2 microwave cured) were cast in a similar way to the pull-out test specimens, which were used to investigate the effect of microwave curing on the porosity of the interfacial transition zone (ITZ). The effect of microwave curing on compressive strength was investigated by casting four 75 × 75 × 75 mm cube specimens in polystyrene moulds. Two specimens were normally cured and the other two were microwave cured. Four shrinkage prism specimens of dimensions 75 × 75 × 300 mm were cast in polystyrene moulds. Two specimens were normally cured and the other two by microwave. A quantity of repair mortar powder and water was mixed together in a Hobart mortar mixer. Each mix was cast in the polystyrene moulds and compacted on a vibrating table. The compacted specimens were kept in the laboratory environment (approximately 20 °C, 60% RH) for 30 min from the time of commencing mixing and then half of the specimens were placed in the microwave oven and cured to reach approximately 40–45 °C as determined by Mangat et al. . The pull-out cube specimens (Fig. 1) made with four different repair materials were subjected to microwave curing using powers of 132 (Series 1), 92 (Series 2) and 60 (Series 3) Watts (Table 1). The temperature was measured at the centre of the top surface of each specimen at the start of microwave curing and then after every 10 min until the end of microwave curing using a Flir i7 thermal camera. The specimens were removed briefly from the microwave cavity to measure temperature at each time increment and then placed back for further microwave curing. The duration of microwave curing was 20–44 min for different materials and applied powers (W) to achieve similar maximum top surface temperatures of 40–45 °C (Table 1). The ends of the steel bars protruding from the polystyrene mould of each repair were directly exposed to the microwaves during the curing period. The cube, prism, and MIP specimens described in Sect. 2.3.1 were cured in the same manner as described above. Three phases of cement hydration processes are considered for starting microwave curing based on the relationship between the dielectric properties of microwaves and the heat generation and transfer properties of microwave energy [5, 6]. These are the early dormant period (during setting), the middle period (at the end of setting) and the final period (during strength development with continuing hydration). The early dormant period (phase 1) is suitable for microwave curing when the system contains both water molecules and cement which continue to react with each other [5, 6]. This period of curing also provides the best compromise between the rate of strength gain and the long term strength of concrete, which has to be made in most practical applications. Application of microwave curing during the middle and final phases, on the other hand, will be more disruptive to the internal structures formed by hydration and result in greater reduction in long term strength [5, 7]. The optimum time between the start of mixing and application of microwave curing (delay time) for developing very high early strength concrete was found to be 30 min, within the investigated range of 20–61 min . Similarly the results of Makul and Agrawal  produced optimum compressive strength with a delay time of 30 min. A 30 min delay time was also used by Sohn and Johnson , investigating the effect of microwave curing on the 28 day strength where the optimum curing temperature was found to be 40 °C for cement and 60 °C for blended mortars. Immediately after microwave curing, the samples were covered with plastic sheets and stored in the laboratory (at 20 °C, 60% RH) together with the normally cured control samples which had remained there since casting. All specimens (normally and microwave cured) were de-moulded 24 h after casting and cured in the laboratory air (approximately 20 °C, 60% RH) until testing at 42 days age. where τ is the average bond stress (MPa); F is the maximum pull-out tensile force (N); d is the diameter (10 mm) and l is the embedded length of the steel bar (50 mm, Fig. 1). where υp is the loading rate (N/s) and d is the diameter of the steel bar (mm). The pull-out specimens were tested in a computer controlled ESH Four Column Universal testing machine with maximum capacity of 250 KN. The tensile force was applied to the longer (threaded) end of the steel bar connected through a hinge to the jaws of the machine. A loading rate of 55 N/s was used. The load and slip, at the loaded end of the bar, were automatically recorded by the machine computer. No yielding of the steel bar was observed in any of the tests. 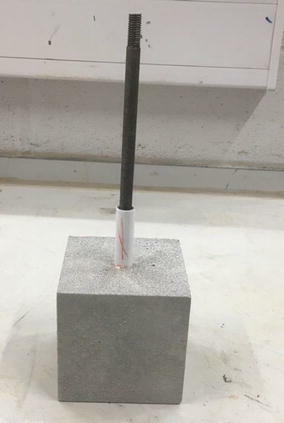 The elongation of the un-bonded steel bar from the loaded end point, during the test, was negligible relative to the slip. where P is the applied pressure (Pa); r is the radius of pores (nm); γ is the surface tension of mercury (N m−1); θ is the contact angle between mercury and concrete (assumed as 140°). The surface tension of mercury is 0.48 N m−1. Compressive strength was determined by testing two cube specimens (75 mm) for each material and curing condition according to the BS 12390-3:2009  at 42 days age. Drying shrinkage was determined by recording length change of the two prisms per curing condition (microwave and normally cured) of each repair material up to 42 days age. The 75 × 75 × 300 mm prism specimens were de-moulded and demec points were attached at the two opposite side faces to monitor shrinkage strain. The first (datum) demec reading was taken at 24 h age from commencing mixing. Subsequent readings were taken at regular intervals. Temperature of microwave curing is one of the most important parameters that affects the properties of repair. The target curing temperature of approximately 40–45 °C was used in this investigation as recommended by Mangat et al. . This target temperature takes into account factors such as temperature variation under microwave exposure, heat of hydration and the effect of high temperature curing on durability . Figure 2 shows typical Time–Temperature graphs, recorded during microwave curing at 132 W, of two pull-out bond specimens. The ambient temperature was approximately 20 °C. The temperature increased linearly during microwave curing. Temperature variation between the two specimens in Fig. 2 is 8% which is due to the different location of each specimen within the microwave oven. Bond at the plain steel bar and mortar interface is a combination of chemical adhesion and mechanical friction. Chemical adhesion occurs between the cement paste and the steel bars. The mechanical friction occurs due to shrinkage of the mortar matrix around the steel bar, which causes radial compressive stress at the interface . The radial compression and the coefficient of friction provide the friction component of bond strength. All pull out specimens failed due to pull out of the bars without any splitting or cracking of the matrix, which indicates that their maximum bond strength was achieved. Figure 3 shows a typical sample after the pull out test. Figure 4a, b show the bond stress-slip curves for specimens of repair Material 1 (Series 1, Table 1). The slip values include the elongation of the un-bonded length of the reinforcement in the pull-out specimens (Fig. 1). The elongation was below 10% of the slip at the maximum pull-out load of specimens. Both normally and microwave cured specimens show a similar rate of slip. Most test results in Fig. 4a show that after the peak load, bond stress starts decreasing gradually as slip increases. Tests reported in literature on normally cured pull-out specimens of plain rebar in concrete show that the slip increases with applied load until it reaches the maximum stress and then the bond stress drops and continues to decrease gradually as slip increases . In the case of microwave curing (Fig. 4b), the bond stress starts decreasing immediately after the maximum stress in all samples, without an extended plateau on the bond-slip curve which is observed for two of the normally cured specimens in Fig. 4a. The bond after the peak bond stress is mainly maintained by mechanical friction for both curing methods. The bond specimens for series 1, 2 and 3 were cured at microwave powers of 132, 92 and 60 W, respectively (Table 1). The following sections provide pull-out results separately for series 1 and in combination for series 2 and 3. Each bond strength value given in the paper is the average of 6 pull-out specimens. The average peak microwave curing temperature of the six bond specimens of repair Materials 1, 2, 3 and 4 were 43.1, 41.5, 41.8 and 41.6 °C, respectively (Table 2). These were achieved after curing at microwave power of 132 Watts for 20 min (Materials 2 and 3, Table 1) or 30 min (Materials 1 and 4, Table 1). Figure 5 and the data in Table 2 show that microwave curing significantly affects the mortar/steel interface bond strength at 42 days age. Figure 5 shows that from the four repair materials of Series 1, Material 2 and 3 experienced a significant reduction in bond strength with microwave curing. The normally cured Material 3 shows an average bond strength of 6.95 MPa which reduced to 4.16 MPa due to microwave curing, resulting in a significant loss of 40%. The corresponding bond loss was less for Material 2, reducing from 6.74 MPa for normally cured specimens to 5.35 MPa for microwave cured specimens, showing a loss of 21%. Repair Material 1 shows a moderate reduction of 10% under microwave curing. The bond strength of steel in the normally cured Material 4 was extrapolated from the relationship between bond and compressive strength in Fig. 9 which is discussed in Sect. 3.7. It gives 11% lower bond with microwave curing. The results show that microwave curing reduces the bond strength of plain steel reinforcement. The likely factors for this are discussed in the forthcoming sections. Figure 5 shows that the maximum reduction in bond strength with microwave curing occurred with repair Material 3 cured for 20 min to about 40 °C at 132 W. In order to investigate the effect of lower microwave heating rates on bond strength, series 2 and 3 bond tests were performed on Material 3 at reduced microwave power of 92 W and 60 W over a longer period of 30 and 44 min respectively to provide a temperature of 40–45 °C (Table 1). The results in Fig. 6 show that microwave curing at 132, 92 and 60 W similarly affected the interfacial bond strength at 42 days age. Material 3 experienced a similar decrease in bond strength of 40, 42 and 36% at the three curing powers of 132, 92 and 60 W respectively, relative to the control specimens. It shows that a lower rate of heating at lower microwave power did not reduce the loss of bond strength relative to normal curing. Reduction in bond strength reported in this paper concurred with the reduction of bond strength of reinforced concrete due to autoclaving  or due to conventional curing at higher ambient temperatures . The reduction of later age bond strength is due to the higher early age curing temperature achieved by microwave curing which accelerates the hydration process. This results in higher early age bond strength, however, the later age bond strength is reduced due to the formation of hydration products of poorer physical structure . In practice, however, the bond strength does not only depend on the properties of concrete but also on many other factors such as the geometry of the reinforcement, thickness of cover and confinement of reinforcement . The reduction of bond strength observed on the plain steel bars with microwave curing may be less significant with deformed reinforcing bars which are normally used in modern concrete construction. Figure 7 shows the compressive strength of the four repair materials at 42 days age. It is clear that early age microwave curing (132 W for 20 or 30 min) has reduced the 42 days compressive strength for all repair materials. A comparison of Figs. 5 and 7 shows that the percentages of compressive strength and bond strength reduction with microwave curing are similar for each repair material. Reduction in long term compressive strength due to microwave curing is previously reported by other researchers [10, 31, 32]. It is due to the effect of the short period of high temperature exposure at early age on long-term strength development. A similar reduction of compressive strength also occurs due to conventional heat curing [4, 33, 34, 35]. The effect of curing temperature on early and later age strength also depends on the type of cementitious repair materials [33, 36]. For example, cement type I cured at 40 °C showed a reduction in its 28 days strength whereas Cem II shows an increase . Both cements showed a reduction in the 28 days strength when cured at 85 °C . Similar differences are likely in repair mortars which use different types of cements and additives. Cement based repair materials exhibit significant shrinkage during service life. The reduction is due to loss of free water in the form of vapour and it depends on the mix proportions, cement replacement materials and admixtures used in the proprietary repair formulations. Shrinkage is a detrimental property of repair materials and a major cause of patch repair failure in service life often due to bond failure at the repair interface . Manufactures often use shrinkage reducing admixtures or expansive cement as shrinkage compensators in repair materials. Figure 8 and the corresponding data in Table 3 present the drying shrinkage results of microwave and normally cured repair materials. The results are the average of 4 readings for each repair material taken from 2 opposite faces of 2 prisms. The results show that microwave curing reduces the drying shrinkage of all four repair materials. This reduction ranges from 7% (Material 4) to 32% (Material 3). Material 2 exhibits the maximum drying shrinkage of 1035 microstrain at 42 days age under normal curing which reduces to 940 microstrain under microwave curing (Table 3). Material 3 exhibits the minimum drying shrinkage of 298 microstrain which reduces to 201 microstrain by microwave curing, resulting in 32% reduction. This reduction is due to the effect of microwave heating at early age which accelerates hydration and also leads to moisture loss by evaporation . Reduction in shrinkage has also been reported under curing with conventional heating [38, 39]. A comparison of the bond strength and shrinkage of materials 2 and 3 shows the impact of shrinkage on bond strength. For example the 42 days shrinkage for the normally cured repair material 2 is 1035 microstrain compared with 298 microstrain for material 3 (Table 3). Materials 2 and 3 represent the highest and lowest shrinkage curves respectively in Fig. 8 for both normally and microwave cured specimens. The corresponding bond strengths of normally cured Materials 2 and 3 are quite similar at 6.74 and 6.95 MPa respectively. This indicates that shrinkage itself has a modest effect on the bond strength. Other factors such as elastic modulus and density of the matrix also have an impact on the radial stresses induced on the embedded steel. The compressive strengths and, therefore, Elastic modulii  of Materials 2 and 3 (normally cured) are similar (23.9 and 21.3 MPa respectively, Fig. 7). The densities of the two materials are also similar. The interfacial transition zone (ITZ) between the concrete matrix and steel reinforcement plays an important role in the bond strength of the steel. Heat curing of concrete increases the porosity in the ITZ, which may reduce the bond strength of reinforcement bars. The aim of this investigation is to determine if microwave curing of repair affects reinforcement bond due to the effect of heat curing alone or if microwave exposure has an additional detrimental effect. Temperatures at the steel surface and in the mortar matrix have been monitored by locating thermocouples at different depths and at the steel surface in microwave cured specimens. Some of the data have been published , other are due to be published by the authors. In addition temperature of reinforcement bars protruding from concrete cubes have been monitored during microwave exposure . The results show that the temperatures at the steel surface are the same as the surrounding matrix without any differential created by the steel. Table 4 shows the effect of microwave curing on the porosity and pore structure of repair materials 2 and 3 in the bond specimens (Fig. 1). MIP test samples were taken from the bond specimens (Fig. 1) at locations representing the bulk material of the cube and the ITZ at the embedded steel surface (denoted as “surface” in Table 4). The bulk material sample was taken close to the middle of the cube but clear from the steel rebar. The ITZ sample was taken at the steel surface. The macro- size interface samples of mortar were taken from the steel surface as described in Sect. 2.3.3. They represent a larger scale of ITZ specimen than the micro-scale samples used for ITZ investigations by other researchers . Bulk porosity: data presented in Table 4 show that microwave curing has increased the effective porosity of the bulk material, relative to normal curing (20 °C, 60% RH), for all four repair materials. For example, the effective porosity at the middle of Material 1 increased from 10.37 to 11.98% under microwave curing. The increase for Material 3 was from 28.49 to 33.74%. The corresponding increase in effective porosity due to microwave curing is very small for Materials 2 (27.92–27.95%) and Material 4 (13.44–13.88%). The results of Material 4, which is CEM II mortar, are similar to the results from Kong et al. who reported an effective porosity of just below 15% for a cement mortar under normal curing which increased to just above 15% under microwave curing. The increase in porosity under microwave curing is due to the microwave heating applied at early age, similar to the increase in porosity due to conventional heating reported by the other researchers [34, 43, 44, 45]. For example, Kjellsen et al. showed an increase in porosity from 10.93 to 15.11% for plain cement paste cured in water at 20 and 50 °C respectively, by using backscattered electron image analysis. ITZ porosity: results presented for Materials 2 and 3 in Table 4 show that the porosity in the ITZ is greater than the bulk porosity for both materials under microwave curing. The ITZ porosity of Material 2 increases from 27.95% (bulk porosity) to 31.16%. The corresponding values for Material 3 are 33.74 and 35.05%. The differences in ITZ porosity relative to the bulk values under normal curing are insignificant. For example the bulk and ITZ porosities of normally cured Material 2 are 27.92 and 28.42%. The corresponding values for Material 3 are 28.49 and 27.85%, both materials showing less than 2% variation in their bulk and ITZ porosities. These results indicate that the increase in ITZ porosity is greater under microwave curing compared with normal curing. This reduces the bond strength of reinforcement under microwave curing relative to normal curing. Increased porosity in the ITZ has been previously reported, for example, by Horne et al. , at both the steel and aggregate interface with cement paste. However, this was a microscopic investigation of porosity on ITZ samples of micro thickness whereas the present investigation used MIP analysis of macro size samples which represent a greater mean distance from the steel interface compared to the specimens of Horne et al. . The results of Horne et al. indicate an exponential increase in porosity of the ITZ at the steel surface under ambient curing temperature 20 °C. Results presented in Table 4 show that microwave curing provides a greater volume of pores larger than 50 nm for all repair materials compared with normal curing. For example, the cumulative intruded volume of pores larger than 50 nm for normally cured repair Material 1 is 40.91 mm3/g compared with 51.87 mm3/g under early age microwave curing. The trend is similar for the other repair materials for both the bulk and interface samples. However, the difference for Material 4 (CEM II) is quite small, increasing from 50.63 to 52.30 mm3/g. However, microwave curing provides a lower volume of pores smaller than 50 nm compared with normal curing with the exception of Material 3. For example, the pore volume for Material 2 (bulk) decreases from 61.17 to 46.06 mm3/g under microwave curing. Again, the difference for Material 4, CEM II, is quite small. In general larger pore sizes (> 50 nm), which refer to capillary pores, are more influential in determining the strength and permeability characteristics and small pores (< 50 nm) play an important role in drying shrinkage and creep properties . Therefore, the reduction of compressive strength of the matrix and bond strength of reinforcement, with early age microwave curing, can be attributed to the increase in the volume of larger pores. On the other hand, the reduction of small pores (< 50 nm) under microwave curing is a reason for providing lower shrinkage reported in Sect. 3.5. Figure 9 shows the relationship between compressive and bond strength for normally and microwave cured specimens at 42 days age. There is a strong correlation between the bond strength of the 10 mm diameter plain steel bar and compressive strength for all repair materials, both under microwave and normal curing. Material 1 (normally cured) with a maximum bond strength of 10.74 MPa provides the highest compressive strength of 40 MPa while Material 3 (microwave cured) shows both the lowest bond strength (4.16 MPa) and compressive strength of 12.5 MPa. where fb is the bond strength (MPa) and fc is the compressive strength of the matrix (MPa). The coefficient of correlation is 0.98 which is similar to the strong correlation of the linear relationship in Fig. 9. A wider range of data may have provided a distinction between the two relationships. The power coefficient of 0.81 in Eq. 4 is greater than the values of 0.5 and 0.67 given in literature  possibly because it pertains to the data on plain steel bars embedded in proprietary repair mortars. Figure 10 shows the relationship between bond strength and effective porosity for both normally and microwave cured specimens at 42 days age. The bond strength decreases as porosity increases. For example, normally cured repair Material 1 shows the highest bond strength of 10.74 MPa and the lowest porosity of 10.37%, while microwave cured repair Material 3 shows the lowest bond strength (4.16 MPa) and the highest total porosity (33.74%). where fb is the bond strength; Vs is volume of solid matrix (1 − p), with a coefficient of correlation of 0.89. The strong relationship between bond and compressive strength (Fig. 9 and Eq. 4) and between bond and porosity (Fig. 10 and Eq. 5) implies a similar relationship between compressive strength and porosity, which conforms to existing knowledge on porosity–strength relationship of concrete . Microwave curing reduces the bond strength between repair mortars and plain steel reinforcement by 10–40%. It also reduces the compressive strength of the mortar matrix to a similar degree. This is accompanied by an increase in the volume of capillary pores (> 50 nm) in the matrix. The reduction is greater with low density repair mortars. Microwave curing increases the porosity of repair mortars at the interface (ITZ) of the steel reinforcement relative to the porosity of the bulk matrix. The temperature at the steel surface matches the surrounding matrix without any differential caused by the steel surface. Microwave curing also increases the porosity of the bulk matrix relative to normal curing under ambient conditions. Microwave curing reduces both the drying shrinkage and the volume of small (gel) pores (< 50 nm) of repair mortars. The bond strength of steel reinforcement has a unique relationship with the matrix compressive strength and porosity under both normal and microwave curing. It increases both with an increase in the compressive strength and decrease in the porosity of the matrix. Therefore, bond-compressive strength relationships used in the design of reinforced concrete structures will be valid for microwave cured elements. where Vs = (1 − p). The authors gratefully acknowledge the European Commission 7th Framework Programme for financing this research for the MCure project (Grant no: 605664) which has developed a prototype for microwave curing of concrete repair.